See our previous post on the 6 Important EAS reactions to know for the DAT. Generally speaking, electron donators / activators have a lone pair of electrons or an electron density that “pushes” into the benzene. Electron withdrawers / deactivators have a positive charge on the substituent or a very electronegative atom attached to it, which “pulls” electrons out of the benzene. All activators AND halogens are ortho-para directors; Deactivators (not halogens) are meta-directing. 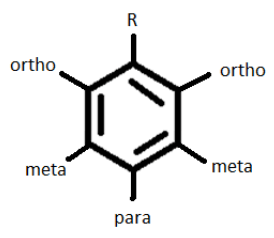 Therefore, depending on the character of the initial substituent (R), a subsequent substituent would be placed at the ortho or para position if R is an activator/halogen or at the meta position if it is a deactivator (but not a halogen). The more electron donating groups a benzene ring has initially, the faster an EAS reaction will occur (due to increased electron density to make benzene a better nucleophile). If there are already two or more substituents on the ring, the strongest donating group gets priority when choosing the location of the added substituent. When given an ortho / para choice, substituents will go to the location with the least steric strain.